It’s official the 2018 Ride has been ridden. And what did we find out? Well, it’s wonderful of course! Though I wouldn’t expect anything less from a company like Red Paddle Co. I recently reviewed their Sport, and now I just want to try them all! Brilliant boards with choices for everyone. They are the highest selling inflatable SUP company in the world. Their products and service being why. Read on to find out how they have claimed that title. 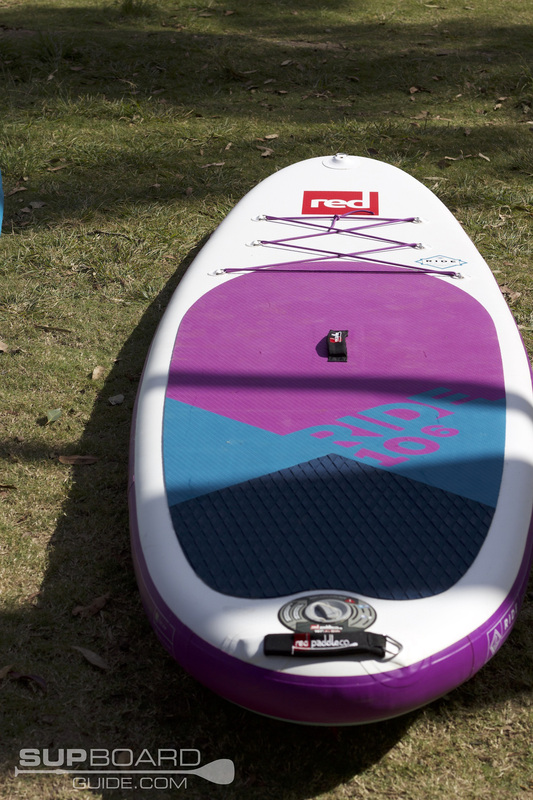 I took the 2018 10’6” Red Paddle Co Ride out onto a lake near Brisbane, Australia for the first test. Then I went to a tidal river near Byron Bay, Australia. Then I also took it out in some waves in the beautiful sleepy beach town of Cabarita Beach, Australia. So it’s safe to say the Ride got ridden. Getting on board, I found it to be stable. Though for a beginner it would probably take a few minutes of finding your feet. The 4.7” thickness is a huge positive into many things, but it does make the board a little less stable than some of its inflatable competitors. Again, this is not a bad thing. I genuinely think it is worth taking a few extra falls to get used to the agility to get the pay off in performance and speed. In the first few strokes, I could tell this was going to be a fun paddle. I could cut moves through the water as smooth as a snake winding its way to land, which I do need to point out can be troublesome for some. The maneuverability is so good that beginners may find the tracking a little difficult. 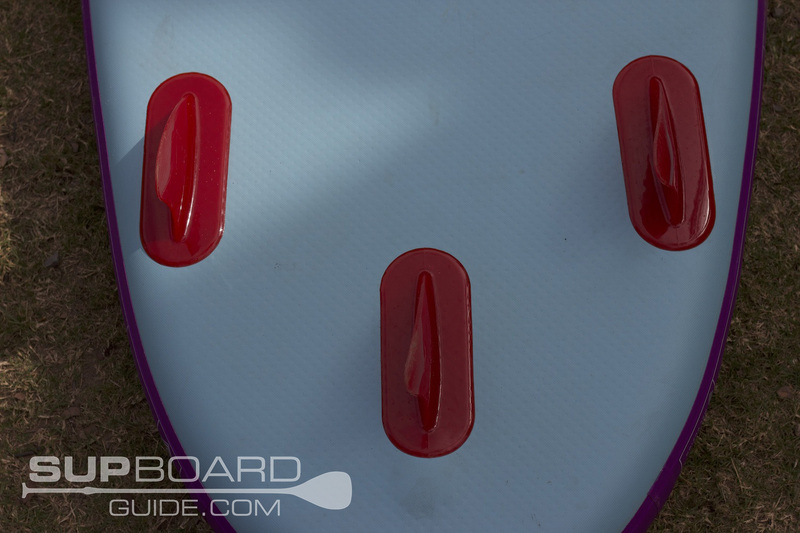 As the Ride has a thruster fin setup, it does give it a huge amount of versatility in the water, but without a big center fin, the tracking must be relied upon by paddling technique. Which as a beginner may take you a little bit to master at first. 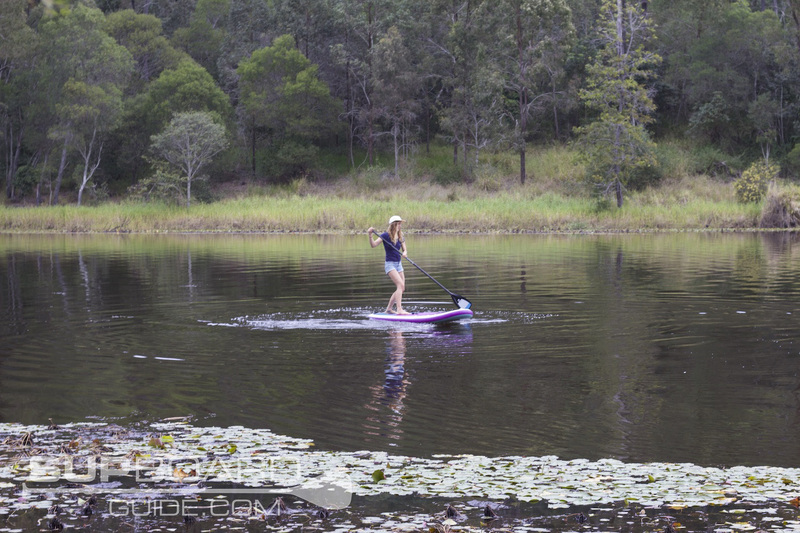 However, if you are confident beginner looking for a SUP that will be able to grow with you, the Ride is a fantastic choice. I also had a friend paddle me around while I sat on the front and surprisingly the Ride did okay to keep moving and paddling us around. I wasn’t expecting that a 4.7” board would hold us and still gain momentum. Now, if you are a bigger rider or quite often take extras with you, you can look at the 10’8” or even bigger again, the 14’ OR if you are taking the whole family 17’. Alternatively, if you’re size suits and you want more performance out of your ride, the 9’8” or 9’4” will perk up your day. You’ll gain a fair amount of speed on the Ride, but it’s not designed for speed. It’s designed to be a versatile All-around board. There are plenty of other SUPs out there that are faster like the RPC Sport is faster as is iRockers Sport, Thurso Surf Expedition… This is to be expected, and nearly all touring boards will be faster than most All-Arounds. Now where it does excel, is the versatility I talked about. It’s stable enough for rapids (for intermediates or advanced riders) and definitely agile enough. The fins being a molded plastic are also great for shallow, rocky areas. As I also mentioned, I took it out in some surf. The surf was only small that day but did manage to go along a few waves. Inflatables, in general, aren’t great surf SUPs. They are tough to get through whitewash, but on a small day at a point break, you can still have some fun! When I was on the tidal river, I did experience some chop as well as currents, and the slight rocker in the nose definitely helped me from blowing away like Dorothy to the land of Oz. Not that I would mind having a talking lion as a friend. But anyway, the point is, this board even though lightweight and not very thick, tackles all kinds of conditions incredibly. One improvement I would like to see, or at least as an optional purchase is removable fins. Being able to put a large center fin it would definitely boost the tracking abilities and would love to see if it would make a difference to speed too. I think it would! Inside this delightful treat of a SUP is all the vital ingredients for making such a high-quality product. Starting with a drop stitch core and following it with a layer of PVC. Which sounds like every board right? However, if you have not yet been introduced, let me get you familiar with MSL Fusion or for the fancy pants, “Monocoque Structural Laminate”. 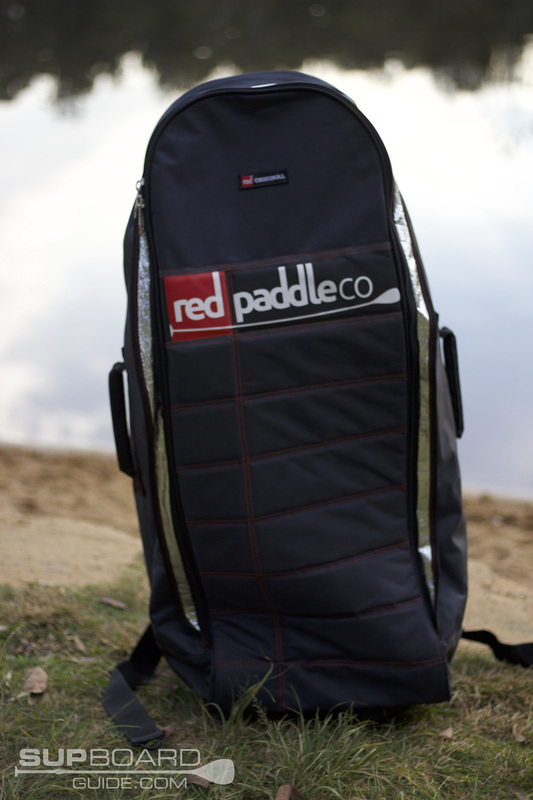 It’s a process that Red Paddle Co has refined over many years. Just like my wrinkles. They fuse layers together. So that drop stitch core and layering I talked about, rather than a hand glue, it’s fused by machine. It accounts for a 2kg drop in weight and maximum stiffness. Boards can withstand pressures beyond 20 PSI and even so tough you can dry a 22-tonne digger over them. Fact: This actually happened. Then, of course, is the waterproof heat-pressed reinforced rails to ensure absolute rigidity throughout the whole board. Finally, on top your deck pad. The cushion for your sole. Where slippery toes go to die, and traction comes to life. Pressed on at 170 PSI, you have to be confident that you won’t have to re-glue the deckpad after a few months of use. Now all of this is information from the manufacturing hub of course. I didn’t personally go oversee the build of a Red Paddle Co Ride. But they do! They only create SUPs in their own warehouses. Now, what I can comment on personally is that they feel and look amazing. You can feel the quality when you are on board, and even with my keen, critical eye, I found no issues in the manufacturing. The seams are even and beautifully flush. No bubbles in the material and the quality of PVC can actually be seen. Sometimes cheaper PVC gets a funny sheen to it and also just looks a bit more plasticky. There’s no separation at any of the joins nor around the inflation valve. This kind of quality also floats over to all their accessories too! To add some stability to your turns and give you all the moves out on the water are your fins. These 3 bright red wonder movers are made from a molded plastic. Advantages of molded plastic are that they flex, so they’re durable and easy to roll up. These are fixed fins. I would hope in the future to at least be able to remove a center fin so I could put in a large hatchet fin for tracking, like the one found on the Sport. This was the best part of the whole ride! The inflation! Which makes no sense right? But using the Titan Pump just makes life so much easier that you can’t help crack a smile. Compared to other pumps I’ve used, this pump inflated my board in a fraction of the time. Even other dual chamber pumps like the iRockers and Blackfins weren’t as fast for some reason. Deflate is much the same as always, push the pin in, twist clockwise and stand over the board like Marilyn Monroe. Let’s do this from top to bottom. Starting at the top, you have a Go Pro mount to capture all those sick moves I said you’ll be doing. And a D-ring! For if you are lazy and want to be towed. Or just to moor yourself to a tree/ deck etc. Moving down from the nose, you’ll find some storage space. 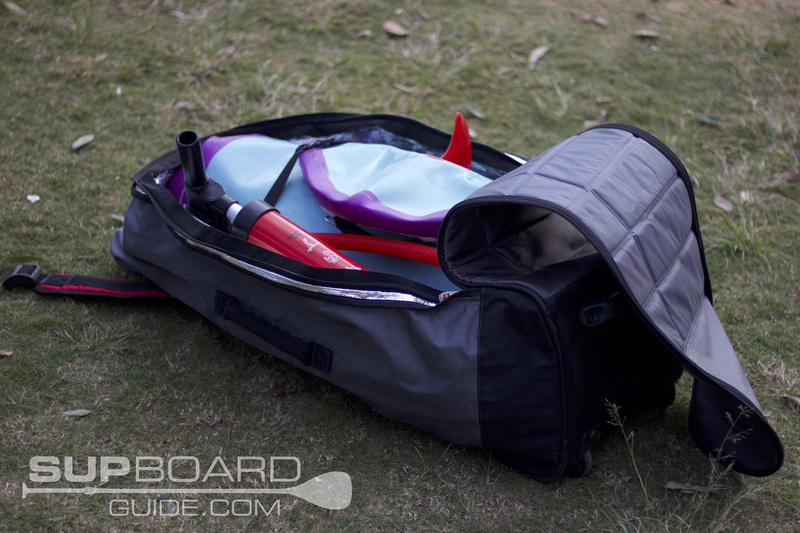 6 D-rings and some bungee chord make for a secure place to carry any gear on your SUPventure. I like this amount of space, the 4 D-ring setup can be a little sparse. Then further down is the thick, easy to grab handle for carrying your board around. But also at the tail, you’ll find another handle for portability. As far as the shape goes, defining features, I noticed was the slight rocker in the nose. This will help you combat wind and chop. Then the wide nose area for max stability and gliding and slightly narrower tail for maneuverability. A nice balance of everything! I obviously tested out a special edition color, which may not be for everyone. Otherwise, the 10’6 Ride comes in the standard blues of Red Paddle Co.
You, unfortunately, aren’t supplied with a paddle or leash. However, if you cruise on over here, you can purchase one of their brilliant paddles or leashes. As well as heaps of other cool accessories! Tip: If you purchase at PumpedUpSUP.com you also get a free fiberglass paddle worth $159. Pumping up your SUP has never been easier! The Titan pump pushes air into your board at 60mph. That’s ridiculous, isn’t it? The dual chamber system and easy to use handle makes pumping extremely effortless in comparison to any dual action single chamber pumps. You won’t feel much extra weight in your bag either with it being an incredibly lightweight design. It fits snugly in your bag next to your board, but I would find it hard to not want to take it out and use it on every SUP! Getting your Ride around is easy with a bag like this. It’s wheeled, with tough, durable wheels for off road terrains as well as airport journeys. But, you can also carry it on your back for those tricky to reach places. Conveniently, the straps tuck right away, kind of like a nappy, into the bags back. This helps keep them from getting caught in the wheels or just being plain annoying. You can also find multiple handles on the bag, which is actually a pretty important thing to me. I’m always struggling with bags that don’t have them. I grab awkward corners to get them into my van, and they don’t always survive long that way. You can easily fit all your gear inside as well as a few extras, and the insulation helps keep everything cool in those summer months. Heat can affect a boards quality over time! Everything you want is in the Ride. The option in sizes means that nearly every single person will find something that they can ride comfortably too. Beginners may find that they prefer other inflatables that have the 6” thickness for stability. Though I highly suggest if you can make the stretch to consider the Ride. Only because if you end up improving, the Ride will be able to offer you much more excitement in the long run. 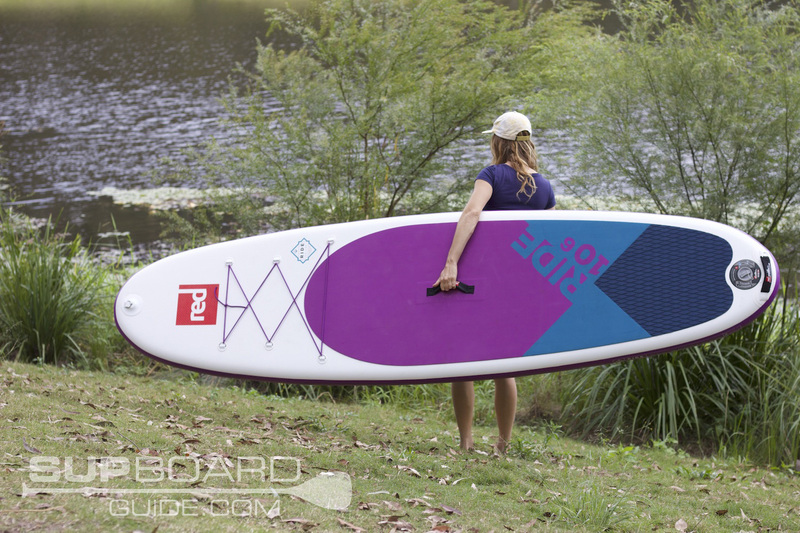 Though if the Red Paddle Co Ride is out of your price range, check out the Earth River SUP Skylake. Or perhaps the iRocker All-Around. 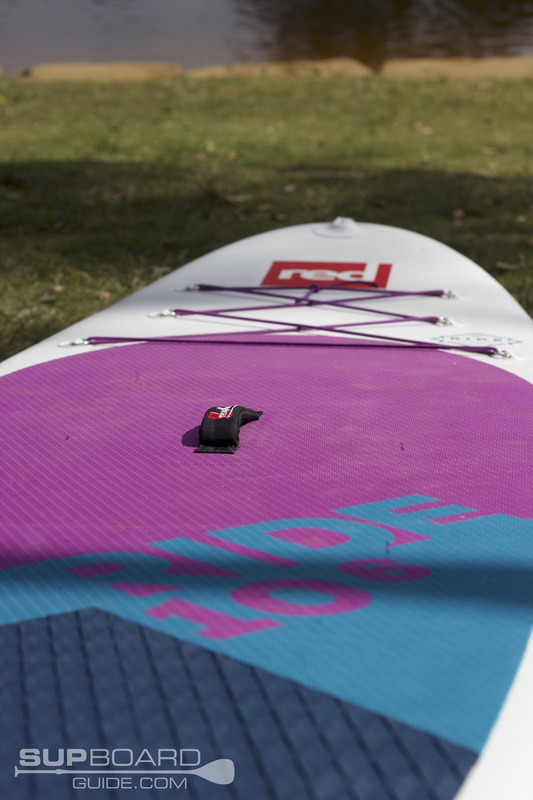 If you are purchasing with Red Paddle Co, you can’t go wrong, they offer a 2-year warranty on all their boards. You also won’t be ringing a dead line, they have exemplary customer service. Now while you are mulling over your decisions, why not go give our FB page a like? As well as Subscribe to our Youtube page! We have weekly content updates on both. And if you just need a laugh to brighten your day, our bloopers in the videos will surely make you smile. Hi, thanks for the great review! I’m 200 pounds… do you still recommend this board or should I look at another instead? Overall the board is a solid all rounder, good job on having score tables on the reviews. I’m newer to SUPing but have not had many balance issues. I had used a Baron 6 the other day and had my pup with me. I weigh in at 180lbs and my dog at 55lbs. Enjoyed the board and didn’t have many issues other than it is a bit heavy. It is a bigger board though. Would the Red 10′ work okay for me and my pup? Thank you! I am between the IRocker 11 and Red Paddle Co 10’6 Ride. I weigh 180 and often take my 20 lb cocker spaniel. I’ve ridden a few boards and feel confident about balance. Want a board that is fast, tracks fairly straight and turns quickly. Will use mostly in a fairly calm lake. I’d say go for the iRocker. It’s definitely the sportier/faster board out of the two. It tracks much better than the iRocker as well since it has a single fin and the Red Paddle Co has a thruster fin setup. I’m a beginner at SUPing (I’ve only gone out twice but loved it). Based on your reviews I’d eventually like to purchase a Red paddle board once I am financially stable. I’m trying to decide between the 10’6 or 11′. I’m 5’6 120lbs, and may occasionally take my 25lb dog. I would mainly paddle on lakes and rivers, some with strong rapids, and would like room for storing some food, clothes, etc. as well. Thanks in advance for your time, your reviews are very helpful! Thank you! Glad you enjoy our content. I assume you mean between the 10’6″ Ride and 11′ Sport. They are shaped differently for different reasons. The Ride will always be the more versatile of the two, as it’s shape and fin setup is made so it can perform in all conditions from surf to rivers. Whereas the 11′ Sport is more suitable for touring. It will pick up more speed and glide more efficiently over long distances. Thank you so much for the advice Sacky! Have you ridden and reviewed the Starboard Drive Zen 2018 which is 10’5 x 30 x 4.75? 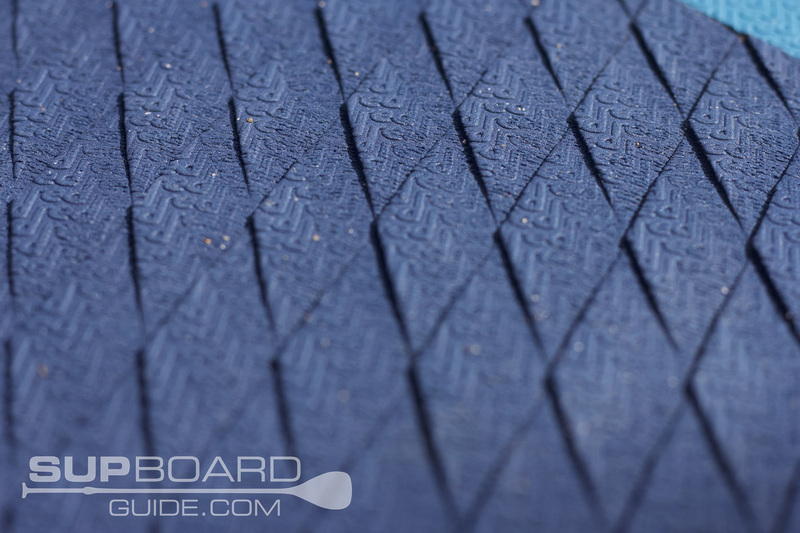 I’ve heard good things about Starboard but I’m not sure how they compare to Red paddle Co boards? I’m interested in the Zen board due to the more affordable price point, and smaller length and width since I’m a smaller rider. I also prefer shorter attached, durable fins since I enjoy cruising in shallow waters and don’t want to worry about longer fins being damaged. Yet to ride the Drive Zen. I had a look into it though for you and I would suppose the price difference comes down to accessories as well as manufacturing. So, I’m guessing you are looking at comparing it to something similar in the RPC range, which would be the Ride. The differences you’ll find with RPC is they have the epic Titan pump (it really is SO good haha), perhaps the bag but don’t want to comment without having seen the bag for Starboard. Then also the dimensions of the board. So the 2018 range of the Drive is now 5.5″ thick I have seen and layers are glued together, the Ride is 4.7″ and also RPC uses fusion technology which helps drop weight but keeps the rigidness. I’m going to just guess the Zen would be a little more stable but the Ride more diverse. 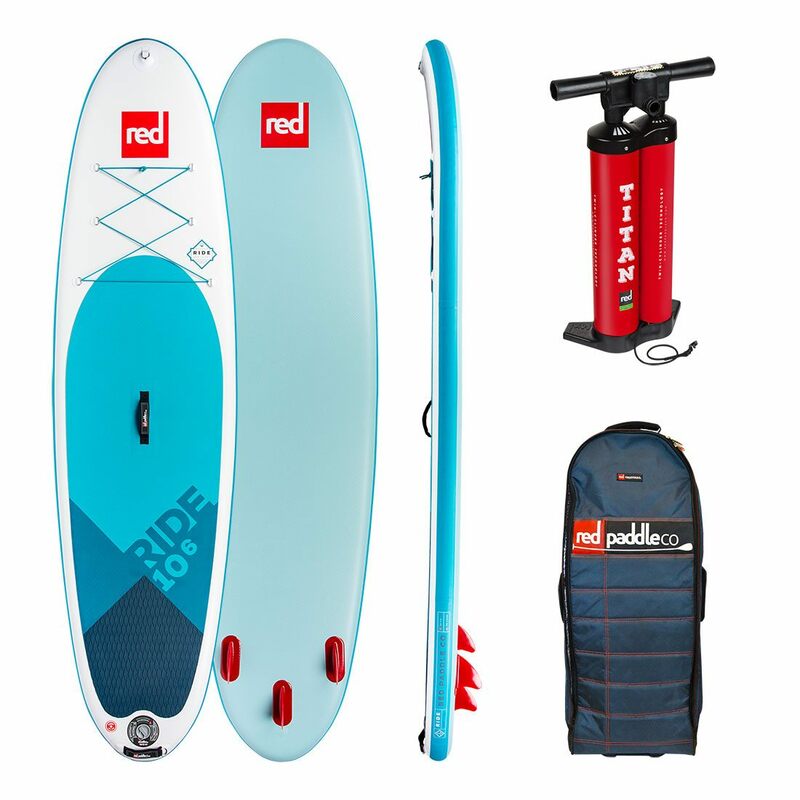 I purchased the Red Ride 10’6 and out of the box it had extremely bent fins. 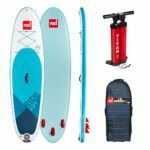 The board does not track well and both Red Paddle co and Air Kayaks where I purchased the board have provided horrible customer service. They have insisted that it’s an easy fix with hot water to remold the fins which has not worked. Also the pump takes a lot of strength to pump up the board, you will be exhausted prior to getting on the water. Then when you unhook the pump the valve pops up and releases a majority of the PSI that you labored over, which needs to be repumped. I believe my board has a glitch in the valve. I’ve watched all of Red’s videos and am following all of the correct steps. I’ve had my board for 2-3 weeks and ride 3 times per week. It’s a beautiful board but way to expensive for the issues that I encountered with the board immediately out of the box. I want other customers to also be aware. I’m hoping to get a refund or exchange for the manufacturing defect but so far thier 2 year warranty hasn’t been honored. Sorry to hear you’ve had such an experience. To start, I also experienced the curled fins but they did go back to shape after leaving it out in the sun for a while. Maybe try that also? It’s a little annoying to fix them but I think it’s worth it for having pretty much indestructible fins. The hose and valve is a tight fit, I’ve done what you said a couple of times. Pushed it in too far and so it pushes and twists the pin into “deflate” mode, it’s finickity but you’ll get the hang of it! I personally prefer that than the slow leaking of other lower quality valves. The bent fins is an easy fix, blow them with hot air from a hair dryer and bend them to desired direction. When you pump the board up, ensure the pin is pulled OUT. This will stop it deflating when removing pump.